Congratulations on your engagement! We, at Mary Immaculate, are pleased to assist you with your plans for a meaningful and prayerful wedding celebration. The Pastor and the Pastoral Marriage Coordinator are ready to assist you in your preparations for the Sacrament of Matrimony. This guide is created to answer some of your questions to better prepare you for your Wedding Day. All Catholic weddings must be celebrated at the parish; weddings cannot be celebrated at home or in “wedding chapels.” The Priests who are serving our community at Mary Immaculate are not available to celebrate weddings in another parish. Have an interview with the Marriage Coordinator at least SIX MONTHS before the date that you will celebrate the Sacrament of Matrimony. A non-refundable deposit of $100. Besides the deposit, the offering for the parish is $250, which must be paid four weeks before the wedding. In the event that you wish to change the date of the wedding you must pay an additional $50. 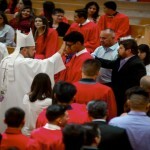 The Archdiocese of Los Angeles recommends that the bride and the groom be at least 18 years old before they get married. If either party is under 21, he or she must have the consent of his/her parents. If someone has not recieved the Sacraments of Initiation mentioned above, consult with the rectory about the necessary preparations as soon as possible. Sacraments MUST be recieved before you schedule a wedding date. In the United States a Catholic couple should not celebrate their marriage in a seperate civil ceremony, e.g. before a judge or Justice of the Peace. The one ceremony in church before the priest is valid for civil requirements of the State of California. The church requires a valid marriage license. You may hold your wedding on any Friday at 5:00pm except for the first Friday of the month. You may also hold your wedding on any Saturday at 12:30pm, 2:00pm, 3:30pm, or 5:00pm. The couple must pay for the music for the ceremony. The parish has a list of musicians who may be contracted by the couple. May be selected and prepared by the couple with the help of the Marriage Coordinator. Couples are encouraged to invite friends and family members to proclaim the readings and to participate as much as possible in the ceremony. We have available the “Together for Life” book for only $5. This book contains several marriage related readings from Sacred Scripture. Ask the Wedding Coordinator about this book. 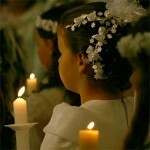 As soon as you have already done all your preparations for the marriage we set up an appointment to do the rehearsal. Please be on time. 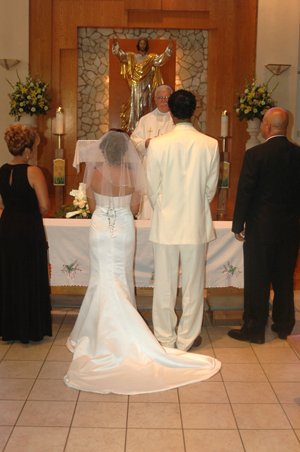 Catholic couples should prepare themselves to celebrate the Sacrament of Marriage and receiving the Eucharist by making a good confession a week prior to the ceremony. 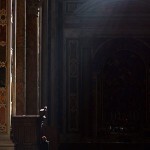 Confessions are heard every Saturday from 5:00 to 7:00pm in the church. All Catholic who attend the wedding are invited to take part in the Eucharist, if they are prepared to receive the Lord, and to take the opportunity for confession beforehand, if needed. If the couple wishes to decorate the church, they may do so, providing their own decorations. They are also responsible for setting up and removing all decorations before the next ceremony. No decorations may be placed on the altar. Please keep arrangements as simple as possible. For safety reasons, you may not put a runner on the center aisle. Please do not place any tape, nails, thumbtacks, or pins on the pews. Throwing rice, confetti, bubbles, etc is not allowed. Picture taking and videos are allowed, but photographers must talk with the priest who will perform the ceremony before the wedding ceremony begins. Try not to change or cancel the wedding date. Be on time, at least fifteen to thirty minutes before the ceremony is scheduled to begin. A marriage license needs to be obtained one month before the date of the wedding because it is valid for three months only. You can obtain the marriage license at any of the following Los Angeles County offices. Be advised that there is a fee to obtain this license. We bless you in your decision to respond to the invitation of Christ to unite your lives in love and faith through the Sacrament of Matrimony. We support you in this time of preparation. Feel free to call our Pastoral Office of the Marriage Coordinator in regard to any questions.